I love a good men’s watch. In fact, I’ve never really been a fan of watches until I figured out I could just wear men’s watches instead of those dainty little watches made specifically for women. I guess that’s because I love big statement jewelry so It makes sense that the men’s watch spoke to me far more than any ladies watch every has. I have gotten in trouble a bunch for stealing my husband’s big bold-faced watches and wearing them. The problem is they are almost always a bracelet so they hang way too loosely on me. 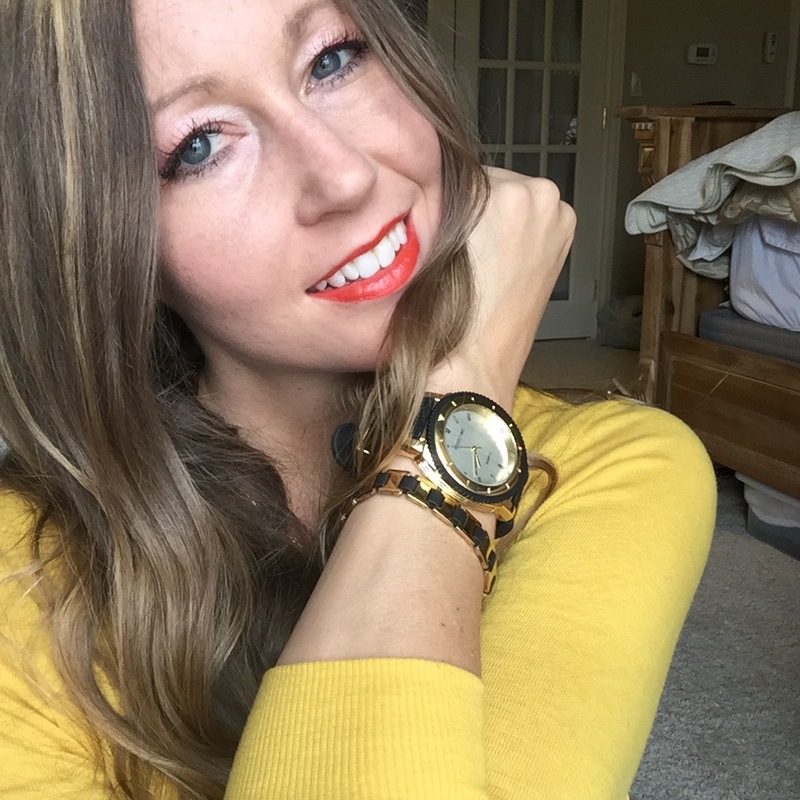 Being a vegetarian I try to avoid leather as much as possible too, so I was super excited when I found the SteelTime Men’s adjustable rubber band, and gold detailed stainless steel watch that comes with a matching bracelet. This is the perfect men’s watch for the fashionista. 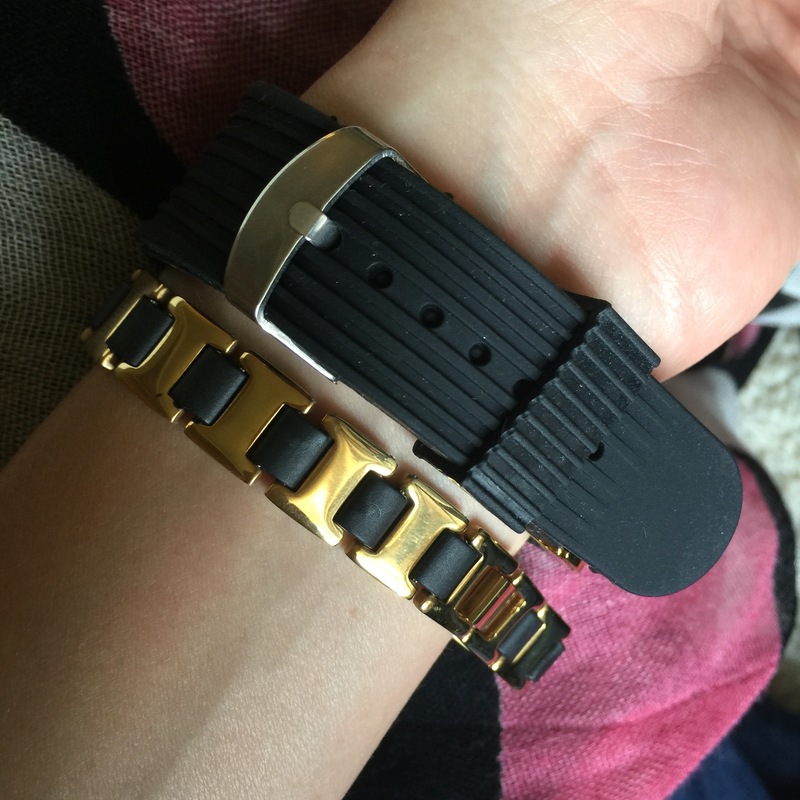 I love that its adjustable so I can wear it as tight or as loose as I like and I can keep switching it up instead of being stuck with one size like when you purchase a watch on a bracelet. The watch is an absolute stand out thanks to the classic, yet modern ultra luxe looking face. Thanks to the rubber band, it is also one of the most comfortable watches I’ve ever worn too. In fact, I took it with me this weekend to Vegas and ended up wearing it nearly the whole time. It’s so comfortable I almost completely forget it’s even there. 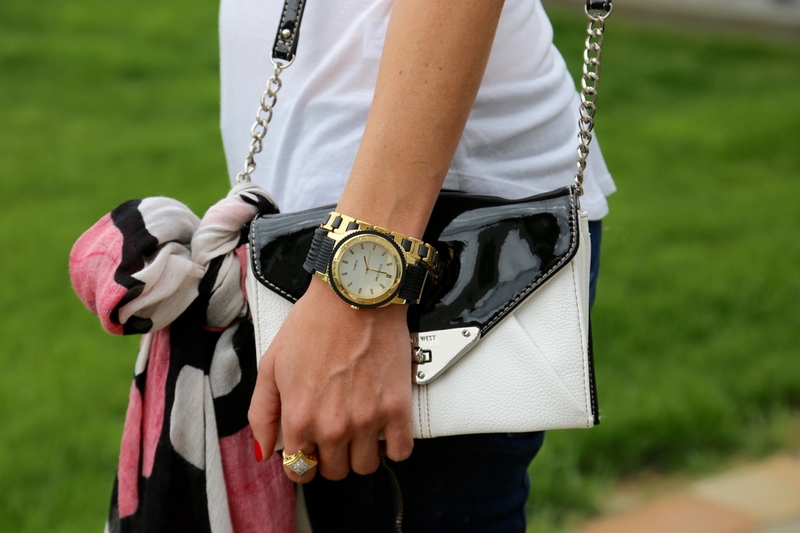 This watch is a great alternative to the bangles or big cuff bracelets a lot of women are use to wearing. I actually don’t often wear much around my wrist because it bugs me hearing the pieces move when I move my arm, or just having it move back and forth up my arm all day, usually getting in the way of whatever I’m trying to do! I can get a nice comfortable fit with this watch, get the bold piece I still want to have, and not have to worry about it becoming annoying once I’ve been wearing it all day, like most of my bracelets so often do! The 18k gold plated details of this watch also makes it an absolute standout. I love that it dresses up my white tank and jeans here, but also looks great with a pretty floral midi skirt too (and is a great way to bring some masculine to an otherwise super feminine look). 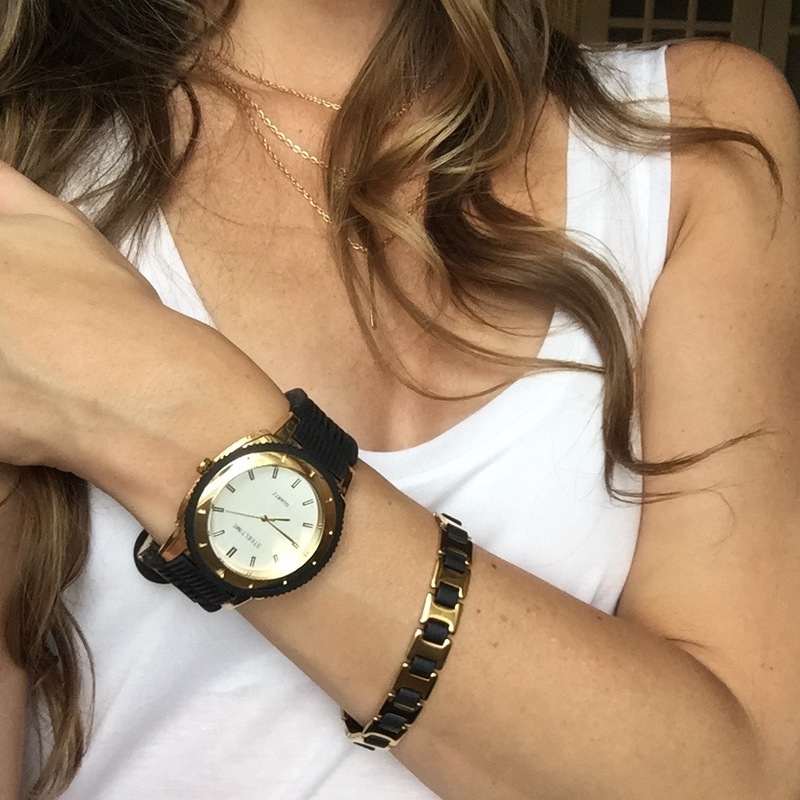 With fathers day coming up, it’s the perfect excuse to buy your husband this watch and then “borrow” it from him when you want to add some instant, masculine style to your look. For only $34 this makes a great gift for your dad and grandpa too! Great watch, right?! I love the gold and black link bracelet that comes with it too! If you would like to learn more about the Steeltime men’s fashion watch or pick up one up for yourself today, then be sure to shop it HERE on Amazon! What do you love most about this watch? How would you style it? Let me know in the comments! I love hearing from you! 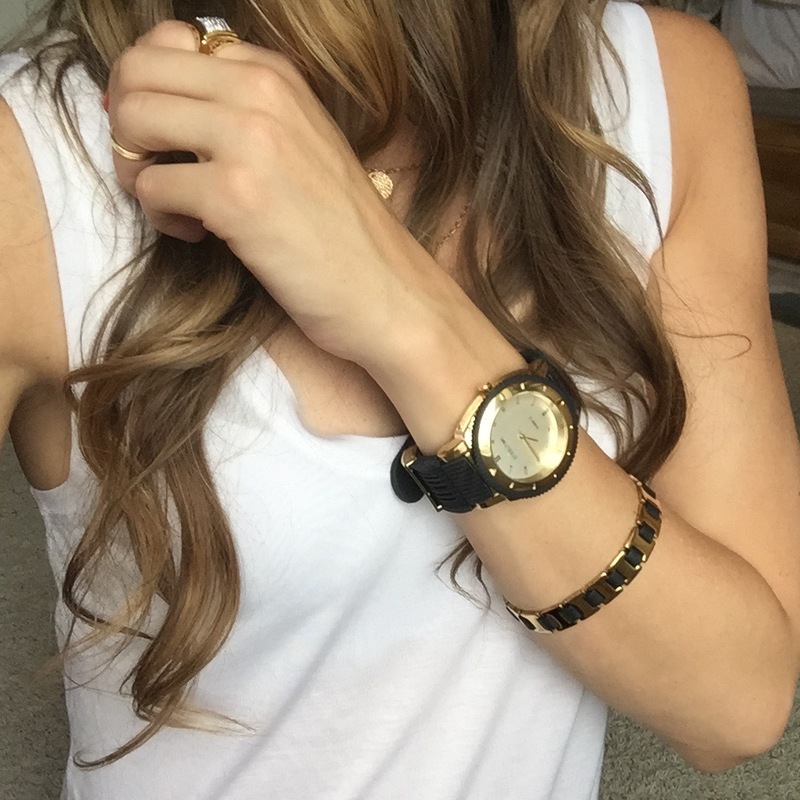 That Watch and Bracelet looks Gorgeous on You! Your such a pretty Lady & the whole outfit looked amazing on you! I really love the watch and Bracelet. Anyone should be Happy to own Them. Thankyou for the Awesome Review! Have a great Day!! You styled the watch great but it is a little big for me. This would be perfect for a Father’s Day gift, though.